Being the parent of a disabled child can affect you financially as well as emotionally. It is estimated that it costs three times more to raise a disabled child. These additional costs are on top of the fact that parents of disabled children often have reduced earning capacity. The extra costs for caring for a disabled child may include special equipment that you need to buy, or paying for specialist care. There is financial help available to help with the costs associated with raising a disabled child. One of the main sources of help is the Disability Living Allowance (DLA) which you can claim for your child. Money that you claim through the DLA for your child isn’t means tested or taxable, and won’t be counted as income in terms of claiming other benefits. The DLA has two main components: the care component and the mobility component. Your child may be entitled to just one of the components or may claim them both at the same time. The care component is paid towards the extra cost of looking after a disabled child, for example helping them with personal care issues. This component is paid weekly at one of three rates, depending on the level of care that your child needs. The mobility component of the DLA is paid towards the care of children who need help walking and moving around. 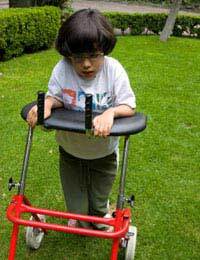 This component is paid at one of two weekly rates, depending on the level of mobility help that your child needs. There are specific criteria in place which will determine the rate your child will receive. To claim DLA for your child, you will first need to fill in a form: the DLA1 form. This is specifically for DLA for children. You can obtain one of these forms from your local benefits office. The benefit will be paid from the date the completed DLA form is received. The DLA form can be quite daunting as it is over 40 pages long, and you are expected to complete it within 6 weeks. However, it’s important to read and understand the form properly and to fill it in carefully. This is important to ensure that your child gets all the help they’re entitled to. Don’t rush. Read through the form slowly a few times. Some parts may not apply to your and your family but it’s better to read the whole thing through anyway to avoid missing out any vital information. Give details. Put as much detailed information on the form as possible. This will give the best possible picture of your child’s condition. Adding extra sheets where necessary is acceptable. Explain as much as possible how your child’s needs are greater than those of a non-disabled child, and in what way. Ask for help if you need it. If you are struggling to fill in the benefits form, don’t be shy of asking for expert assistance. The local council will be able to put you in touch with a relevant benefits advisor.